Every day, Heroes are around us all the time, yet we rarely hear about them. When we listen to the News and catch the headlines it sometimes feels like a World gone mad. Have you noticed though how it sells papers when they have a negative story to catch our attention? Yet, there are thousands of stories we seldom hear about, where people and small groups reach out to help, to be kind, not because they have to, but because they want to. The Spirit Guides have often remarked and they want us to know that there really is a growing amount of people who are waking up to their own true nature of Love and Kindness and are acting on it. And . . . the more we do this, the more we overcome the balance of Light over Darkness in the world. Just a couple stories I caught recently, are shown in the pictures this month. The top picture shows a lady who remembered a few days later that her savings was in her discarded refrigerator. She went to the Junk Yard but at first they couldn’t find it amid the piles of scrap metal and car parts. But Mike Downer, who works there, went the extra mile and found it squashed between two cars and working hard to pull it apart he found the money. The lady thought it was hopeless and hadn’t left her number so when they found it they alerted the media and found her after all. The lady of course was delighted to have her savings returned and decided to use a bank in the future. The amazing picture above happened in Australia. While getting off of the train a man fell and his leg was caught between the train and the platform. He was trapped and couldn’t get out. Commuters all came together and actually created enough strength together to actually push the train far enough for him to be pulled free. They have some good pictures of it. 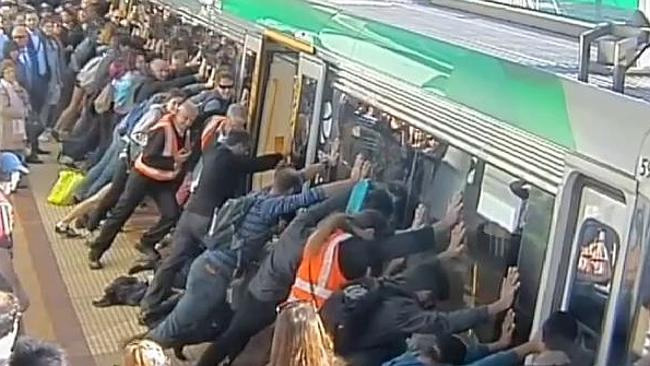 If you want to see it just Google – Picture of People pushing train. When enough people get together, going the same direction, they can create miracles. Did you know that we can always find what we are looking for? If we are looking for problems or ‘What’s wrong with the World.’ Guess what? We can prove it and easily make a huge list of all of the things that are wrong and awful. It’s easy to spot them. But the opposite is true as well. If we look for things that Delight and Inspire us. We’ll find them too. All it takes is a Shift of Attention. Decide what you want to focus on. You’ll be surprised. Things you didn’t even notice before will pop out at you. When is the last time you REALLY noticed a flower, a garden, a scene, a sunrise or sunset on the same old road that you drive all of the time? Take a fresh look, see what you’ve been missing. Another thing the Guides would like for us to remember is “Thoughts are Things.” A thought is Energy and Energy helps balance the scales one way or the other to the Positive and Negative vibrations that are around us. This Energy affects us all. You know what it feels like to walk into a room that feels comfortable and good or one that feels tense and yucky. High School Science showed us everything is Energy. The table, a chair or a pillow vibrate differently. A person, also a Loving thought or a Negative or angry thought sends out vibrations. So like it or not, we live in this Soup called Energy. When we are in an Attitude of Gratitude for all the things around us somehow the people seem nicer. Or, what they do doesn’t bother us quite as much as it did before. Laughter is a wonderful, positive boost to the energy around us. Music affects us too. Deliberately, choose what feels good. Play with it see how you can actually affect it. I’d like to challenge you for the rest of this month to take a minute each night before you go to bed to review your day. Ask yourself what did your Words and Thoughts and Actions add to the Soup of Energy around you this day? You may find you added to both the Negative and the Positive vibration, and that’s all right. But now that you are Aware of it. You can actually choose WHICH vibration that you want to add. Do it for those you love around you. Do it for yourself. Be kind. Be caring. Be happier because what you add to the World, just like a Boomerang, it will come back to you. So why not make it a Better Place?